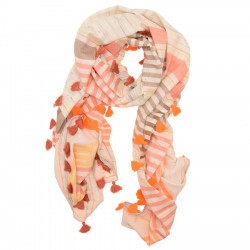 This jacquard stripy scarf is trendy with its pompoms that will give you an elegant and natural style. Lovely jacquard stripy stole. This scarf will highlight your outfits with its touch of orange. Adorned with colours pompoms tone on tone, it will give you a chic and natural look. 90% cotton, 10 % polyester. This long cardigan is ideal to wear for a casual look, can be closed thanks to the fastener under the pane. 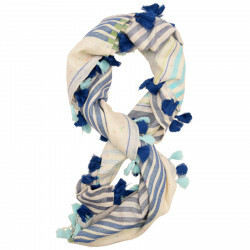 For a chic and bohemian style, fall for this jacquard striped scarf that will highlight your outfits with its touch of blue and its finish with pompoms tone on tone.